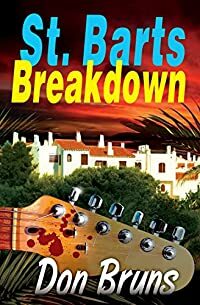 St. Barts Breakdown by Don Bruns, a Mysterious Review. Review: Music journalist Mick Sever's latest assignment is to interview legendary producer Danny Murtz at his Caribbean hideaway on Saint Barthélemy in St. Barts Breakdown, the fourth mystery in this series by Don Bruns. Danny Murtz hasn't been interviewed in 15 years, but has agreed to participate in an A&E special on his life and music to be filmed on St. Barts. The Chicago Tribune in Murtz' home town is also doing a profile and the producer has agreed to be interviewed by Sever at the same time. This isn't to say that Murtz hasn't been newsworthy; firearm charges, abuse, resisting arrest, DWI, drunk and disorderly, and assorted other pleasantries have kept Murtz on the cover of tabloids for years. When Sever arrives on the tiny island, he quickly finds himself immersed in a tangled network of the producer's associates, friends, and enemies, at least one of whom seems to want Sever dead. And he hasn't even been introduced to Murtz yet. St. Barts Breakdown is far more intrigue than mystery and is based in part on the premise that there have never been any murders on Saint Barthélemy. The multiple points of view keep the reader fully informed as to what's happening at all times and for the most part why. There's the mysterious, unnamed woman who seems to be stalking Murtz, but even her activities don't really generate much suspense. Bruns takes a light, almost relaxed, approach to his narrative which suits the characters and the setting in particular very well. There are glimpses of humor. At one point Sever is in a nightclub and doesn't know if the sofa bed is for sitting, reclining, or some other position and is then referred to as an older man by the woman he's with - it's really quite comical. And despite the rather large number of dead bodies that remain on the island when Sever leaves, none are classified as a murder, keeping St. Barts' record intact. Finally, there's a nice ironic twist in the concluding paragraph that brings closure to a certain plot point. St. Barts Breakdown is an entertaining, if somewhat predictable, addition to this series and is possibly the best entry to date. Acknowledgment: Maryglenn McCombs Book Publicity provided a copy of St. Barts Breakdown for this review.